This is my third attempt as this race, my body is just not geared to marathon running but have been preparing for this months now so optimistic about reaching the start line this year fingers crossed. Just wandered is anyone else was doing this and wanted to share training progress/experiences? I'm doing P&D up to 55 mile 18 week plan, my aim is to get a good for age time for London. So far training is going well, my biggest issue recently is blisters but been using zinc oxide tape for a couple of weeks and this has got round the problem. Come over and join us on the P&D thread. There are a few others doing Abingdon on that thread as well. I'm doing Abingdon too! Was hoping there would be a thread. I may possibly be going for a London GFA too. This will be my 2nd marathon after London this year. Was going to be loosely following a P&D plan but I was generously brought online coaching for my birthday so my plan is set by him! Into week 3 now of a 16 week plan. How did you get on in London? Have thought about online coaching, how does it work? I decided to see a physio before I started P&D plan and he identified quite a few weaknesses, mostly due to a lot of treadmiĺl running, weak glutes and hamstrings. Done quite a few months of strengthening exercises and it is really helping this time, also not getting carried a way and over doing it. I did 3.22 in London, passed 13000 runners from pen 4 so a lot of weaving round traffic! Basically the coach sends me a training plan every 2 weeks. Have a weekly phone call to go through everything and keep in regular contact through text/email. He tracks my runs on Gaemin Connect/Strava to keep an eye on the training. Its going really well so far! What's your target for Abingdon? Sub 3 is GFA for me but that might be stretching it. Good idea seeing a physio, I'm also doing weekly strength exercises to try and keep injury free. I am 44 so it's easier for me. I would like to do 2:50 but never done a marathon before, done a 1:21 half a few years back and a 36 min 10k so should have it in me, just got to stay injury free. Had to join a gym this week, 16 miles on Sun and not long before first 20, hard to stay hydrated in this heat and may have to do treadmill next few long runs in till it cos a bit. 2.50 is a great target! i can't even imagine doing a long run on a treadmill. I got away with not carrying water for my long runs though the winter, can't do that now. I got s cheap running backpack from Lidl which I use to carry a couple of bottles. 2:50 is the target but to be honest, getting to start line without injury will also be an achievement, if I can do that then time should be achievable. Normally head out around 8, did 13 at 1 o clock last Saturday and that toasted me! Yeh getting to the start line is always the main aim! Following a schedule should mean you don't over do it though so hopefully all will be fine! Week 7 nearly done, all going well so far, 18 miles tomorrow and all going well, will take me to 52 miles this week. StevieWh, you may do this already but I've started half filling bottles, freezing them and add refrigerated water just before the run, keeps it nice and cool for a lot longer. I need to start thinking about refuelling now as will do my first 20 miler next week and good practice for race day. 16.5 for me today and 54.8 for the week. Week 5 for me as I'm on a 16 week plan. I took 3 bottles with me today, 2 with electrolyte tabs in and one plain water with ice cubes, seemed to work pretty well! I used gels for fueling in all my training for London. The science in sport caffiene ones are especially good for a boost at the end of a long run! Had a bad end to last week, had some discomfort just below my left ankle bone and had to bail after 5 miles on my 18 mile run on Sunday. Rested till Friday for a 10 miler and all good, there was a time I would have kept running but did the right thing. 5 mile recover on Sat and then 20 miles (2:21), probably a bit on quick side for long slow run for me but felt good for most of it, apart from last 2 miles which was hard. Really pleased as that is the furthest I've ever run. Thanks for the gel tip StevieWh, might get some, hope your training is going well. Did a 16 mile run today, was supposed to be 12 miles at marathon pace but did the whole lot at what I think I could do if it was today, so managed to do it all at 2:56 mile pace so happy with that at this stage. Had to get new trainers this week, had Brooks gts for last 10 years but decided to get the Brooks ghost 11s as was getting sore feet and my over pronation has gone so do not need the support the gts provides. Would be good to hear anyone else doing this race, hope training is going well. How is the ankle? Hope the new shoes feel good, I recently got some On Cloud X's which I've been using for intervals and tempo runs, really impressed with them. Training has been going well here, set a big PB at parkrun on Saturday with 18.09. So things are moving in the right direction! Still haven't ran over 16 miles but my total mileage is a lot higher than previous so I'm not worried. Plus theres still a while to go. I know there is a couple of people form the 3.15 thread doing Abingdon. That is a very speedy 16 miler, well done! How are you feeling after it? Hi StevieWh, Ankle all good, only lost 2 sessions in the end, just a niggle that went away. New shoes are great, I am not the lightest so I need the extra cusioning and it is working out well so far. That is a great 5k time, was thinking of doing a race soon as no idea what shape I am in, not done any races at all for over a year now. The 16 miler was great, was fine after. Recover week this week, which works out as at center parks, next week will be my second 20 miler, they scare me a bit to be honest but probably the most important. The 20 milers are vital, helps so much on race day knowing you have got some good long runs in. I've got a 10k in 2 & 1/2 weeks and then a half at the end of September. That should give me an idea of what sort of time I'm looking at for Abingdon. Enjoy the rest at Center Parks! StevieWh, what are the races you are doing? I've been looking but not finding much. May end up doing Swansea bay 10k but much further than I would like to travel. May do a park run next week, not done one before. There is also the Windsor half end of September which I can still enter but it's 3 weeks before Abingdon so not sure if this is too close. 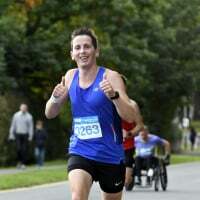 I’m doing Cheltenham Half three weeks out from Abingdon as well. Looking forward to it. Well worth doing a few parkruns, nonstick. Can take them as you please - super hard, end of a long run solid effort or just easy and social. Unfailingly very welcoming a sociable. Is the Cheltenham half fast? I can see that they are still accepting entries. In terms of travelling, Bristol and Cheltenham are about the same. Got a slight quad niggle right now so will take a few days out to recover fully. Sorequads, will definately do a park run, there are a few tune up race sessions on Saturdays so will fit on ok, although these are supposed to be 8K-15K. See you at Cheltenham and Abingdon Sorequads! Cheltenham is fairly quick. My PB t Wokingham is 1:19, I anticipate being 90s to 2mins slower at Cheltenham. A few slight rises, but definitely hills. Could be a touch windy roun he racecourse at the end. A really good route I think. See you there! The sub 3 dream is looking alive at Abingdon! Hope the training is going well both. Great negative split Stevie. And a hell of a PB! How are the long runs going. Three weeks until Cheltenham and six until Abingdon! Well done StevieWh, definately looks like your on for a sub 3. Unfortunately I've not run much last 2 weeks, had some quad discomfort that moved to groin which became obvious that I was going to do some serious damage if I continued running. Went to a physio on Wednesday and he diagnosed tight quads and glutes that was the cause and did some massarge and acupuncture (first time). Doing lots of foam roller, stretching quads and glutes. Quads feel good but groin still sore so not ready to get back to it, physio recond 4-5 days before I could run so crossing fingers that I will be back to it and not lose many for days. Enjoyed watching Great North Run this morning, I got a place a couple of years ago but could not get accommodation so had to leave it but will definately give it a go at some point. The PB was set when I first came back to running with not a huge amount of training, still needed beating though! Long runs are going well, got 20 planned on Saturday with 12 at MP split into three blocks. I'm away for a week from next Sunday and won't get much running in. I will try and swim every day though to keep the fitness up. Looking forward to Cheltenham! Hopefully you can get back to it soon Nonstick. Is there any cross training you can do? Actually feels much better today. I can cycle, did 1 hour on the bike in my local gym last week and did not seem to cause any problems, may do the same today.